These pictures where taken quickly with my phone, but I wanted to share with you the delectable things from our food group last month. The subject for the month was squash and pumpkin and I was amazed at what people shared. 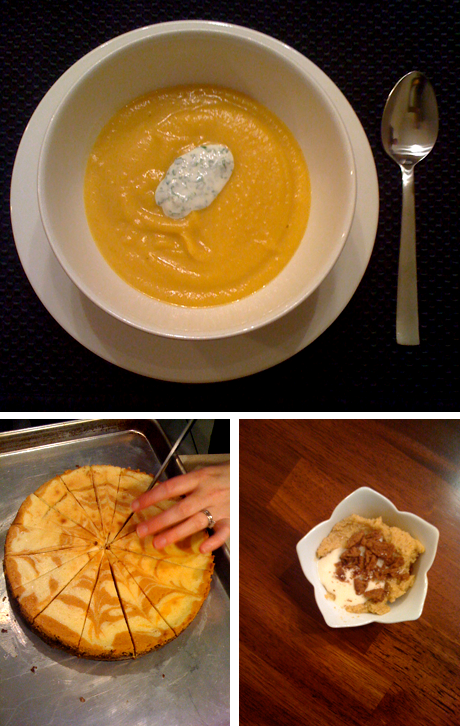 Butternut squash soup with a creamy cilantro yogurt, pumpkin cheesecake, homemade spiced pumpkin ice cream, and more... What is your favorite recipe including squash or pumpkin? These look marvelous! How lovely that you have a food group? How fun would that be?!! I would totally join. I have been making a butternut squash pasta sauce with sage, onions and parmesan this winter. It's tasty! yummy! and how did you get such great pics from your phone?! awesome. i'm actually making pumpkin cheesecake tonight with some friends; i hope it turns out well! I love the pumpkin chocolate chip cookies from allrecipes.com!! I am obsessed with pumpkin soup...smooth and creamy with a hint of ginger. yummy! our whole family could eat pumpkin and squash till we turned orange. everything looks so delish here-and um, how on earth did you get those pix on a phone camera? that's just amazing. Great story you got here. It would be great to read a bit more about this topic. i really like butternut squash and granny smith apple soup, or acorn squash and pear soup. squash and fruit pairings are my favorites! looks great -- oh, and btw, your phone takes better pics than my camera!? I just heard of this recipe from the Editor of Gourmet magazine, where you carve out the goop of a pumpkin, and inside put chunks of your favorite bread, a bunch of parmesan cheese and your choice of another white cheese, fill the rest with chicken broth and bake in the oven. And when you scoop it out you get this soupy, cheesy, bready soup with chunks of pumpkin. I thought it sounded fantastic. I'm still trying to find that actual recipe online. Ahhhh my favorites! My mum makes the best butternut squash soup every Christmas and I love love love pumpkin cheesecake (I used to devour these pcc muffins in a Haight Street coffee shop..a la San Franciso...) you brought back very yummmmy memories. thank you!! Yummy! I just had a very amazing cauliflower soup last week too and it was so good.